"The slavic melancholy and the special spirituality of the pieces inspires Charlie Mariano to jubilant flights between heaven and earth. Vitold Rek shines with extremely virtuoso contributions. Stunning, breathtaking!" "This is jazz of arrestingly strong character: infused with both the spirit of the music's history in American improvisation, and the heady flavour of European art and folk music tradition." "The bassist's singing, noble pizzicato tone cuts through on 'Song of Love' like a tenor cantor intoning a mass. Rek's astonishing technique and musicality shine throughout the album and the quality of the compositions and interplay cannot be faulted." "Cathedral Vol. 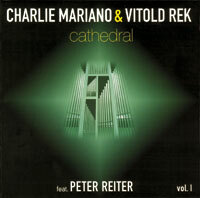 1, again pairs Rek with Mariano and features Peter Reiter on pipe organ. This music has an organic depth borne out of the artist's sense of self. 'The music is very personal and honest: I recorded the music I had in my body and being and it came out formed exactly as I had envisaged', Vitold comments." "Aprés un remarqué Opus absolutum, publié sur Taso Music, la collaboration entre le saxophoniste Charlie Mariano et le contrebassiste polonais Vitold Rek se poursuit avec un enregistrement baptisé sobrement Cathedral. Rejoint par l'organiste Peter Reiter - qui se voit offrir, pour cette session, le privilége de jouer l'orgue de l'église de Saint Marien de Neu-Anspach (Allemagne) oú réside le contrebassiste - le duo exploite tout l'espace sonore offert par ce lieu. La résonnance naturelle renvoyée participe á enrichir la palette sonore d'une formation marquée á la fois par une sensibilité classique dans le traitement de la matiére et par envie de quitter les chemins trop fréquentés. Les trois musiciens servent de fait une musique riche et inspirée aux accents romantiques qui démontre toutes les qualités de composition du contrebassiste polonais. Un album á offrir (et á s'offrir !)" "...The three musicians have produced a rich and inspired music with romantic accents which shows all the Polish double bassist's qualities as a composer. An album to buy as a present (or for yourself!)"